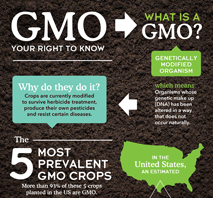 GMO WHAT = Organisms whose genetic make up (DNA) has been altered in a way that does not occur naturally. GMO WHY = Crops are currently modified to survive herbicide treatment, produce their own pesticides, resist certain diseases and slow oxidation of product. 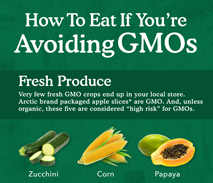 GMO WHERE = Eleven commercial crops in the U.S. are grown using GMO seed, more than 70% of packaged foods in North America contain GMOs and GMO farmed salmon has been approved for sale in the U.S. and Canada. Labels are not required, and we’re all about informed choice, so here are our best tips for how to shop if you're avoiding GMO products.